Forgive me for posting more than one recipe in a week, but I haven’t been able to get it together enough to write anything else this in the last few days. I was pretty busy at work last week and I’ve been all over the place this weekend. At the beginning of a weekend I always feel like I have tons of time to do everything that I want to, but then the two days pass so quickly that I hardly know how I spent them. It’s a bit frustrating, really. But that’s a subject for another time. 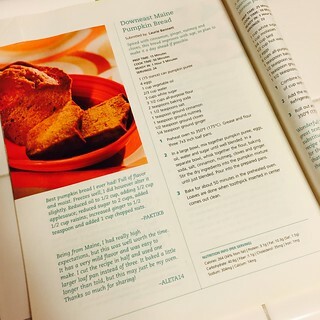 Getting back to the food, I can’t believe I’ve never posted either of my favorite pumpkin bread recipes before! I must remedy this error as quickly as possible. Since fall technically started last week I decided to bake some pumpkin bread for my co-workers. Of the two most successful recipes I’ve tried, this one is the easiest since it doesn’t require any out of the ordinary ingredients. (The other recipe calls for “cook and serve” vanilla pudding mix which I never have just lying around.) I’ve had a couple of cans of pumpkin sitting in my cupboard since last year, begging to be made into yummy treats, so I didn’t even have to get any at the store before whipping up this delicious seasonal treat! By far the best thing about this pumpkin bread is the mix of spices. I added the pumpkin pie spice myself, and maybe next time I’ll throw in a little cardamom for good measure. You really can’t go wrong. I’m not sure anything tastes more like fall than this pumpkin bread. Plus, the recipe makes 2 or 3 loaves. It’s so good you’ll need that much to go around! In a large bowl (or extra large if you have it – this recipe produces a lot of batter! ), stir together the canola oil (you can substitute 1/2 c butter and 1/2 c oil if you want), pumpkin, water, eggs, vanilla, and sugar (you can use a mix of white and brown sugars if you want). Add the baking soda, salt, cinnamon, nutmeg, cloves, ginger, and pumpkin pie spice, and stir until combined. Now it’s time to break out the electric mixer (if you haven’t already). Add 2 c of the flour (I used a combination of all-purpose flour and whole wheat flour) to the bowl and blend until combined, scraping down the sides of the bowl with a spatula as needed. Add the other 1 1/2 c of flour and blend until combined. Divide the batter between a couple of greased loaf pans. The original recipe calls for three 7×3″ pans, but since I don’t have any of those I used one 9×5″ pan and one 8×4″ pan instead. Bake at 350 deg F for about 60 minutes, or until a toothpick inserted in the center comes out clean. Keep in mind that if you use pans of different sizes, like I did, the smaller one will be done faster. Enjoy! Based on All Recipes’s Downeast Maine Pumpkin Bread. It’s that time again – time to prepare for the annual chili cook-off at work! October is almost here again which makes me extremely happy. I’ve already decorated my apartment for Halloween so that’s taken care of, and now I can turn my attention to fall cooking. Usually I’d be focused on baking, especially cookies and cakes with pumpkin or apple, but this year is going to be different. I’m not saying that I won’t be making any seasonal goodies (I’m actually baking some pumpkin bread for my co-workers tonight), but I won’t be eating too many of them since I’m working on eliminating grains from my diet. I even bought gluten free soy sauce on Saturday (for some amazing cashew chicken that I’ll post another time). Yep, I’m that committed to making a change. So instead of scouring Pinterest for new and exciting pumpkin cookie recipes (although my favorite pumpkin oatmeal chocolate chip cookies are pretty much perfection), I started searching for Paleo-friendly chili recipes to try. When I saw this recipe for bacon chili I was really excited to try it. How could chili + bacon be bad? Anything with bacon in it is bound to be a hit with my co-workers, which will give me an edge during the cook-off. And the bacon chili turned out to be not just good, but great! The bacon and bacon grease made the flavor out of this world. Next time I think I’ll try adding more bacon (because why not?) and some other vegetables (carrots, at least). This is an excellent jumping off point for this year’s chili cook-off! Cut the bacon slices into 1/2 in pieces. In a large nonstick skillet, cook the bacon over medium heat. Once the bacon is cooked though, remove the bacon from the pan and set aside for later. Add the diced onions and peppers to the pan with the leftover bacon grease and cook until the onions get tender and start to brown, about 10 minutes. Add the ground beef to the pan and cook until no longer pink. Add the chili powder, cumin, coriander, garlic powder, oregano, salt, black pepper, and cayenne pepper. Stir and cook until fragrant, about 2 minutes. Add the reserved bacon and diced tomatoes and bring to a boil, then reduce heat to a simmer. Cover, and cook for about an hour, stirring occasionally. Remove lid and let the chili simmer for an additional hour or so to thicken up. Enjoy! Note: Rather than simmering on the stove, I made this in the slow cooker. However, cooking it on low for 8 hours made the vegetables way too mushy. If you’re going to finish this chili in your Crockpot, I’d either not pre-cook the onion and pepper, or just cook it on low for no more than 6 hours. Maybe less. I’ll make a few changes next time and see how it turns out. Based on Kate’s Healthy Cupboard’s Bacon Chili (Gluten Free). This is the reason I was so excited to get my iPhone 6. As of today, no more cracked screen, pieces of glass falling off right and left, and taking pictures with a scratched camera lens. Woohoo! 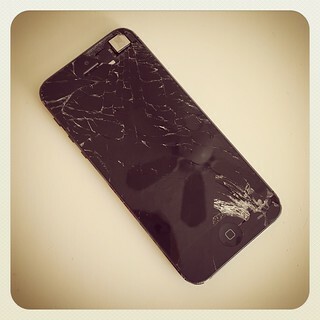 Don’t worry, I’ll get a case for it tomorrow. Gotta protect this shiny new phone from my clumsiness. So after I finished my first half marathon a couple of weeks ago my mom asked me what my next challenge was going to be. At the time I had no idea, but I think I’ve got something lined up now. Despite being fairly active since the beginning of the year, I haven’t been able to maintain any sort of weight loss. I actually joined a weight loss challenge in January with mixed results. My goal wasn’t to lose a lot of weight, but dropping 5 lbs would be fantastic. I started out somewhere around 123 lb and at one point in February I was down to about 120 lb. I was ecstatic! But then I had surgery, causing me to be sedentary for a while, and the numbers on the scale rebounded very quickly. How frustrating. Even after I started running regularly again in March, my weight wouldn’t budge. I dropped out of the weight loss challenge after six months because sharing my stats every week was more stressful than motivational. And as I’ve said, I try to avoid sources of unnecessary stress in my life. They just aren’t worth it. So I gave my scale the summer off and vowed to not weigh myself again until after the Labor Day weekend. What incredible freedom! I ate what I thought was necessary in order to keep up with my half marathon training program, including a few days of major indulgence before my longest runs. The only measure of my body’s size was my clothes. 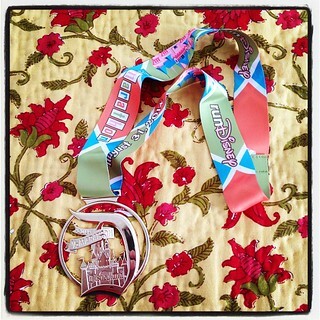 On the morning of the Disneyland Half Marathon, the last thing I was worried about was my weight. I was happier to cross the finish line that day than to see a low number on the scale. The day after the race I tentatively got back on the scale after a three-month hiatus. It read 121.9 lb. I was skeptical of this number, however, since I’d just completed a grueling 13.1 mile run and I was sure I had lost a lot of water weight. The good news is that a week later when I got back from DC (where I ate a lot and didn’t exercise) I weighed exactly the same. Maybe it was real weight loss! Or not. A few days later I was 126.3. Two days after that I was 123.9. And then the next day I was 122.1. My body is so weird. So what could I do to try and jump start some consistent weight loss/maintenance? After doing some research and talking to some friends and co-workers, I decided to try eliminating grains from my diet. It’s not technically low carb (I still need starches for running fuel) and it’s not strictly Paleo (I’m still eating dairy and potatoes), but I think it’s the first step towards keeping my weight on a more even keel. This means I can’t have any bread, cookies, crackers, rice, or pasta. It seems restrictive when it’s put that way, but I’ve been told I won’t miss the grains after a while. We’ll see about that. I definitely have to put more thought into my meals now and it will require me to start cooking more often. I’ve been lazy in that respect this year, but last night I slow cooked some chicken and roasted some carrots and green beans to take to work for my lunches. This will have to become a regular occurrence. Do you realize how difficult it is to find a grain-free meal at any kind of restaurant? I had a great breakfast of scrambled eggs, sausage, and potatoes at Disneyland last Sunday morning, but your average eatery doesn’t have much that’s not served on a bun. So I started my grain-free journey this week and so far I feel great! Grains aren’t completely absent from my diet yet (I had a box of Frosted Mini Wheats in the cupboard that I didn’t want to go to waste), but I’m getting there. I know this sounds vain, but my ultimate goal is to be able to wear a couple of pairs of jeans I bought back in 2012 that are too tight at the moment. Of course I want my body to be healthy and to fuel it for the long runs I’ve got coming up later this year, but comfortably zipping up those jeans would make me feel even more amazing! I’ll let you know how it goes. I have a confession: I’ve already decorated my apartment for Halloween. It’s not anywhere near the scale of my Christmas decorations (no tree, obviously), and I usually wait until October 1st to put them up, but I decided that I want to enjoy my Halloween items for longer than usual this year. The weather is unrelentingly summer here in Los Angeles, so the fall décor reminds me that cooler weather will be here eventually. (As far as I’m concerned, fall can’t come soon enough.) The funny thing is, before Halloween last year I only had one item to decorate with, and that was Witch Duck. I love Witch Duck dearly, but Halloween needs more celebration than that in my apartment. So in early November I bought a couple of things on sale online in preparation for Halloween 2014. Like the Peanuts set in the above photo. Isn’t is great? 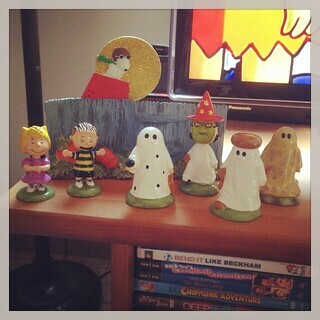 “It’s the Great Pumpkin, Charlie Brown” is my favorite Halloween tradition so I was happy to find this adorable set at Macy’s. Regarding the quote from my 11/9/13 webpage post, as soon as I saw the pumpkin luminaries appear in the Pottery Barn catalogs again I bought two of them. No way I was going to miss out on them again this year! I don’t have a good photo of them yet since I haven’t bought any battery-operated candles to go inside, but I’ll get around to that soon. Another thing I missed out on last year was getting a set of Halloween-themed Minnie Mouse ears at Disneyland. I should have bought them at Disney World last September/October when I was working at Cape Canaveral, but I figured there was plenty of time to pick them up when I got back to California. I was wrong. By mid-October the orange and black spiderweb design ears that I wanted were nowhere to be found in Disneyland. So this year when I saw the Halloween items first appear in the park shops I bought a pair immediately. Yet another thing I wasn’t going to miss out on this year. Now if only some cooler weather would come along then it would really feel like Halloween is approaching! On the morning of August 31st I woke up at 2:45 AM to get ready for the Disneyland Half Marathon. My parents and I had to leave my place at 3:30 AM to drive to Anaheim so I gave myself just enough time to get dressed, make a smoothie, grab the necessary items, and walk out the door. I was afraid that getting into the Disneyland parking structure would be a mess if we arrived any later than 4 AM, but luckily it turned out to be a breeze. 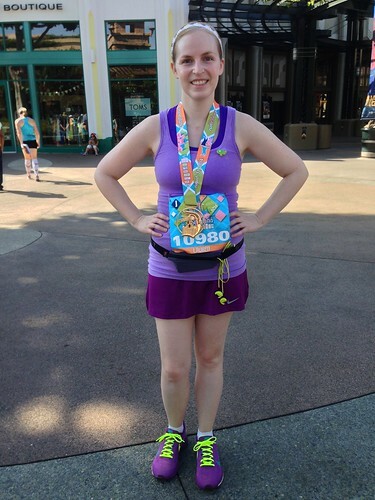 I had saved braiding my hair, slathering on sunscreen (which seemed counterintuitive before dawn, but I knew I would need it later), and even putting on my running shoes until we arrived at Disneyland that morning. I was incredibly nervous. I was pretty sure I’d cross the finish line under my own power, but remembering how horrible I’d felt during my 14-mile run a couple of weeks early didn’t make me feel any better. Based on the fact that I hadn’t provided a proof of time (I missed the deadline) I was going to be one of the last people to cross the start line. That was unfortunate, not just because I had to stand in my corral doing nothing for more than an hour (starting at about 5:15 AM), but because the sun was already up before I started running. It was already really humid that morning and the appearance of the sun was only going to cause the marginally comfortable weather to deteriorate. I crossed the start line around 6:30 AM. The first part of the half marathon runs through California Adventure and then Disneyland. That was cool. Going through Sleeping Beauty’s Castle was pretty awesome, despite having to walk that portion due to the large crowd trying to squeeze through a relatively narrow passage. I didn’t stop and take any pictures with Disney characters during the race because I didn’t want to lose momentum (and because I’m no good at selfies), but I did see my parents on Main Street in Disneyland. It was very encouraging to have them there cheering me on. Taking on my first half marathon was nerve-racking enough – imagine if I’d had to do it alone! I was feeling great upon leaving the Disney parks at mile 4, and that feeling continued for a few more miles. I started to fade around mile 6, though. Up until then I’d only been getting water at the aid stations to avoid the nausea that I suspected was caused by the sugar and artificial sweeteners in the sports drinks and energy supplements I’d tried, but I realized that I needed something more. So I started grabbing Powerade at the aid stations instead. That helped, and I kept running along the streets of Anaheim. A little after mile 9 the course went through Angel Stadium, which is another cool venue to run through. But when I emerged on the other side, right at mile 10, the sun emerged from the clouds for good. That was bad news. It got really hot after that and I started feeling tired and slightly sick to my stomach. The combination of Powerade and heat was a killer in my case, I think. I walked a lot during those last three miles so I was extremely happy when I saw the mile 13 marker because I knew I was nearly done. I ran across the finish line faster than I should have because it made me feel ill, but I was so thrilled to have completed the race. My first half marathon, and definitely not my last. It won’t be long until I have another half marathon medal to hang next to the one I earned at the Disneyland Half Marathon! Chocolate chip cookies #49: Based on Two Peas and Their Pod’s Whole Wheat Toasted Oatmeal Chocolate Chip Cookies. Baked on 7/20/14 and 9/1/14. Geez, I’m a terrible blogger. Despite this past week being the quietest I’ve had in months, I still haven’t been able to compose a webpage post. How pathetic! Fortunately it’s the weekend so I’ll try to make more time for writing over the next two days. But for now, here’s a chocolate chip cookie review. I’ll bet you’re wondering where chocolate chip cookie recipe #48 went, right? Well, I’ll get back to that one later because I need to make another batch before I can render a verdict. So I’m skipping ahead to these toasted oatmeal chocolate chip cookies. The first time I made these they weren’t a complete success because I made some mistakes. First of all, I only toasted half the amount of oatmeal that I needed. Then, without thinking, I dumped the first half of the toasted oatmeal in with the rest of the dough before toasting the second half. Oops. That first batch of oatmeal sat in the bowl absorbing moisture for 15 minutes or more before I was ready to bake the cookies. Not ideal. I thought that might have been the reason that a weird sort of crust formed on the top during baking that made for quite a bit of difficulty when I tried to slice the cookie bars. So while my parents were visiting over the Labor Day weekend I made another batch to see if I could improve the results. And I did…marginally. Don’t get me wrong, these cookies tasted really good (and my co-workers on both the East and West coasts enjoyed them), and the flavor of the toasted oatmeal was great, but I think it was a bit too dry. It seems you can’t do a straight substitution of toasted oatmeal for untoasted oatmeal in without making a few other changes. I think maybe a little more butter would help. I’ll make another batch of these cookies sometime and see if that idea works. When I found out that I’d be travelling to DC for work right after the Disneyland Half Marathon, I knew I wanted to stay at a hotel with a decent fitness center. Most places only have one treadmill in their sorry excuses for hotel gyms, but one I’ve stayed in before has a refreshingly large room full of cardio equipment instead. So I booked a reservation there for my trip so that I’d be able to keep up with my running even after completing my half marathon goal. The best laid plans, right? Of course I had great intentions, but when it came down to it, I wasn’t able to follow though. I packed my running shoes, workout clothes, and even the Disneyland Half Marathon headband that my parents bought me, but unfortunately I got back home with all of them unworn. I flew to DC early on Tuesday morning (6 AM flight) and arrived in the early afternoon. I went directly to work, without even getting lunch or checking into my hotel because I had a lot of work to do before the next morning. Unfortunately it turned out to be four hours of work. I wanted to run 3 miles on the treadmill that night (since it was way too hot to run outside), but I didn’t get to my hotel until about 10 PM and I was exhausted. Since I had to get up at 5 AM the next morning to go to work, I decided to get right in the shower and go to bed instead of running first. My first post-race run could wait. The next day was extremely stressful and I ended up working 12 hours without any sort of a break. My lunch was a banana and a Fiber One bar. On my way back to my hotel I went to Target, grabbed a ham and turkey wrap and a Greek yogurt, and was barely able to wait until I got back to my room before scarfing them down. I was on the verge of passing out at that point and my alarm was set for 5 AM again, so another night passed without a run. And then another one, since Thursday was almost exactly like Wednesday. At that point I realized that I hadn’t gotten a full night’s sleep in about six weeks. I felt awful. So on Friday morning I slept in until 8 AM. It was glorious. I finished up my business trip by working a few hours, grabbing a bite to eat, and then catching my flight back to LA. While I’m not happy about missing two runs while I was out of town, the work portion of my trip was very successful. One thing at a time, I guess. My Avengers Half Marathon training starts on Tuesday!